Wedding photography from just £249!! and is amongst the lowest priced professional wedding photography you will find locally, so if the budget is tight look then no further. You possibly have already checked a few other photographers prices and may have been slightly shocked! 5 Star wedding photography at truly affordable prices! This is one of the most affordable wedding photography packages available here in Nottingham and the surrounding area. ✓ Two hours attendance on the day to record the wedding as it unfolds. ✓ Coverage normally starts at the venue 30 minutes before the ceremony starts, to get all those wonderful images of the groom, best man and guests arriving. Continues with the arrival of the Bride, the ceremony itself, the Bride and Groom emerging and formal group shots as you require. If time allows will also include some early coverage of the wedding reception. 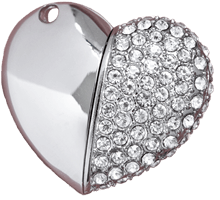 ✓ After your wedding, you will receive all your fully edited photographs on a stunning "Heart" USB. ✓ Copyright release of the images, allowing you to print any photo as you require. ✓ Longer coverage available if required. ✓ We keep your photographs until at least your First Wedding Anniversary, so if you or your family later decide that you'd love a few extra prints just let us know. The fully printable "Heart" USB now also contains a MP4 slideshow of all your photographs, so you can sit back and watch your special day on your widescreen TV and is accompanied by a fantastic wedding soundtrack playing in the background! ..and don't forget to check our "Gallery" page, to see some of the previous weddings we have undertaken. Copyright 2019 Glenn Mather Photography. All Rights Reserved.